Frank & Kraft Attorneys at Law is an estate planning and elder law legal firm with a proven record of providing our clients with the help and guidance they need for effective estate and end-of-life planning. We are proud to serve the Hamilton County area, protecting our clients’ assets, aiding them as they work to grow their wealth, and helping them prepare for everything from incapacity planning to the distribution of their estate assets when they die. If you’re looking for a professional legal team committed to securing your retirement needs, then we are the one firm you can count on for solid estate planning in this area. According to current estimates, Hamilton County has a total population of 309,697. The county is considered to be part of the Indianapolis-Carmel-Anderson Metro area, and is ranked as Indiana’s fastest-growing county – as well as one of the fastest growing counties in the county. There are three large cities in the county: Carmel, Noblesville, and Fishers. The county has received recognition from outside organizations, and was judged by Forbes.com to be America’s Best Place to Raise a Family back in 2008. The online magazine cited the county’s elite schools, healthy economy, and affordable cost of living as reasons for praise. Carmel earned CNN Money’s praise in 2013, and was named the best place to live that year. The county’s economy is diverse, with agricultural concerns dominating much of the northern region. Hamilton is also home to companies with a broad range of industrial focuses, including information technology firms, legal and financial services, and innovative manufacturing companies. That strength of diversity offers substantial opportunities to people with many different skills. As residents in the area enjoy these wealth-growing opportunities, they can count on Frank & Kraft Attorneys at Law to help them manage and protect those assets. The median age of Hamilton County residents is 36.6 years. Approximately 10.9 are aged 65 or older. That contrasts with a statewide senior population that makes up 14.6% of the population. Hamilton County is slightly younger in overall makeup than Indiana as a whole. The more than 30,000 seniors who live in the county have a number of living options available to them. Many reside within their own homes, while others live with their families or in nursing care facilities. Caring.com provides a listing of nursing care options within Hamilton county, including several that have received top rankings from reviewers. Of course, seniors and their families should do due diligence in researching these facilities to ensure that they locate the ideal care setting. Some seniors may also want to explore in-home care, particularly when Medicaid benefits may not yet be available. Frank & Kraft Attorneys at Law can assist seniors as they explore their long-term care needs and options. 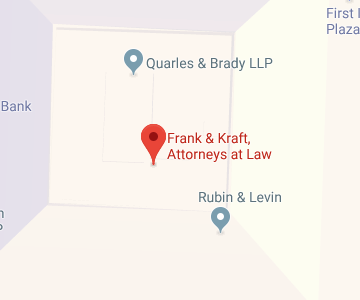 At Frank & Kraft Attorneys at Law, we can help in all of these areas and more. You can and should make use of every available legal tool at your disposal to ensure that you achieve maximum financial security while providing for future eventualities that might threaten your family’s wellbeing. We can help. Probate matters within Hamilton Country are handled by the Hamilton County Superior Court. The County Clerk’s Office is located at 1 Hamilton County Square, Suite 106, in Noblesville, IN 46060. You can contact the Clerk via the county’s website, or call (317) 776-9629 between the hours of 8:00 AM and 4:00 PM, Monday through Friday. Probate courts are necessary for the administration of many decedent’s estates. This is true regardless of whether or not that person left a will. Frank & Kraft Attorneys at Law can help estate executors and the decedent’s heirs to better understand and navigate probate proceedings. We can also assist with guardianship proceedings when a loved one has lost the capacity for decision-making. Our attorneys can also assist you in preparing for future incapacitation so that guardianship never becomes a concern, while also helping you to create an estate plan that can eliminate the need for probate altogether. At Frank & Kraft Attorneys at Law, our legal professionals have the expertise you need to manage all your probate, guardianship, estate planning, and elder law concerns. Each day, we provide clients throughout Hamilton County with the assistance they need to ensure that their retirement, incapacity, and estate planning needs are met. Contact us online or call us today at (317) 684-1100 to learn more about how we can help you to better secure your tomorrow.